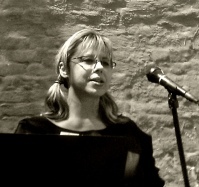 Helen Vitoria’s work can be found and is forthcoming in: The Offending Adam, PANK, The Awl, Ping Pong Journal, Rougarou, Gargoyle, Barn Owl Review, The Baltimore Review, Dark Sky Magazine, GRIST, Pebble Lake Review and many others. She is the author of nine poetry chapbooks, a poetry pamphlet from Greying Ghost Press, a full length poetry collection, Corn Exchange (Wild Chestnut Press, 2013 and ALWAYS, a collaborative ekphrastic book of poetry and photographs from Curbside Splendor,Concepción Books, 2013. Her poems have been nominated for Best New Poets & the Pushcart Prize. She edits THRUSH Poetry Journal & THRUSH Press.